Stoneman Douglas senior, Never Again MSD push for lasting gun control reform. 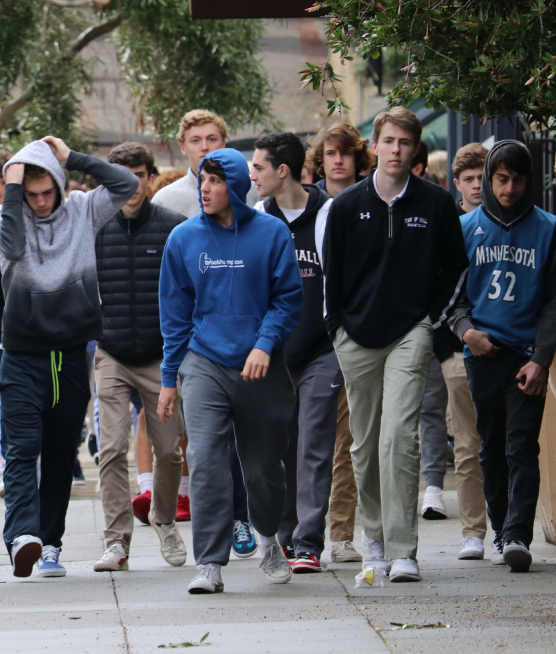 Eli Mundy ’19 leads a group of students in a walkout on March 14. The walkout was part of a national movement organized by Never Again MSD. Following the murder of 17 students at his school, Marjory Stoneman Douglas, senior David Hogg has gained national acclaim for his outspoken stance on gun control and school safety. His work, and that of the Never Again MSD organization, has started a national movement in which Convent & Stuart Hall students have participated. Hogg has been on national news outlets calling for change to gun control laws, which has gained him both the admiration and hatred of many Americans. Hogg and his classmates founded Never Again MSD to fight for gun reform and to make school campuses safer. The idea for the organization came from MSD student Cameron Kasky, who enlisted the help of fellow students and alumni. March for Our Lives had satelite marches around the country and the world and inspired the national school walkout that took place earlier this month. Convent & Stuart Hall students, along with millions of students across the country, participated in the walkout on March 14 to try and bring awareness to the issue. “You could feel the power that the shooting had around the nation, especially at a school like ours,” Max Rodriguez ’18 said. “You could just feel the energy and see the emotion in the faces of every student and faculty member. Students on the Broadway campus walked down Fillmore Street with students from Convent Elementary and Stuart Hall for Boys, while students on the Pine Octavia Campus assembled outside the green gates and then walked around the block. The #StandUpSpeakOutWalkout protest caused many students to be suspended for their participation such as in Cobb County, Georgia and in Independence, Missouri. Convent & Stuart Hall High School administration let students know beforehand that their participation would not result in disciplinary action, assuming they did not violate the Student Handbook in another manner. The occurrence and deadliness of school shootings has increased since the attack on Columbine High School in Colorado which left 13 students and faculty members dead. Shootings at Sandy Hook Elementary and Stoneman Douglas have been some of the schools to join Columbine in the history books as some of the most deadly. San Francisco has been relatively untouched by gun violence on school campuses, although four students were injured at the June Jordan School for Equity in 2016. Infrequent events does not warrant a lack of awareness, according to Hogg. Drills are not an infrequent occurrence at Convent & Stuart Hall which prepares for the event of an active shooter on campus by simulating “lockdown drills.” The school recently practiced one as a part of National School Safety week. Students practice sheltering in place, out of view of the windows, as well as evacuating open spaces such as the courtyard and the Carrol Learning Commons. Hogg says that these drills are important for safety, but that increasing gun control is an even better step to saving lives on school campuses, and that the best people to push for this reform are the youth themselves. “You think it won’t happen to you but it can and it will, unless you take action,” Hogg said.